Iain McIntyre’s first book, 2004’s Wild About You!, was unfortunately a very limited edition, published by, of all people, the Community Radio Federation with assistance from the Melbourne City Council! I could launch into a tirade generally on the lack of guts and imagination of Australian publishers, but to their credit, South Australia’s Wakefield Press (with the on-going support of the CRF) has come to the rescue of this, McIntyre’s new, third title. McIntyre is a Melbourne musician (member of bands NinetyNine and the Hatchetmen), writer, 3CR DJ and (political) troublemaker (his second book was the self-published Disturbing the Peace). His breed is rare these days and should be encouraged. Wild About You! was terrific. Co-authored by McIntyre with Ian D. Marks, it made good its sub-title - Tales from the Australian Rock Underground, 1963-1968 - as a collection of essays and Q&A pieces on, thankfully, not just the usual suspects from the first wave Australian beat boom. Tomorrow is Today is its bigger, brighter, better companion volume. 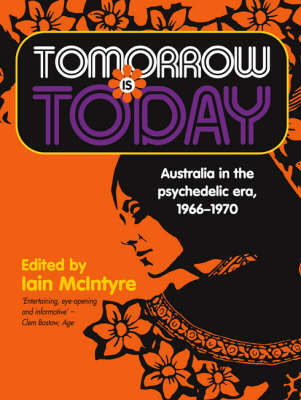 As Keith Glass points out in his introduction, in a way the 60s might not have begun till 1963, when the Beatles hit - and then after San Francisco’s Summer of Love in (our winter of) ’67, the times were very different again… The literature of Australian rock, then, is now sufficiently sophisticated to allow McIntyre to divide the decade up along these lines. Beautifully packaged like Wild About You!, Tomorrow is Today is almost fanzine-like in the piecemeal way it presents its story, with a sidebar timeline running down every page and different contributors taking different approaches to different aspects of the narrative. The individual chunks on, say, fashion and, again, the not-so-usual suspects, written by, among others, McIntyre himself, Ian Marks, Keith Glass and Tagdh Taylor (author of the brilliant Top Fellas), all dovetail together to generate a real sense of momentum. It’s a patchwork that does add up to a quilt. Or, you can just dip in anywhere you like. It doesn’t cover everything, but rather lets the parts suggest the whole. Either way, my shame at not knowing more about ‘forgotten’ figures like Jeff Crozier or Juno Gemes is now somewhat allayed. But the real clincher is the photography, which freeze-frames the extraordinary, naïvely vibrant atmosphere of the period. In that sense, this book is as much Colin Beard’s as anyone’s. Beard was a house snapper for Go-Set magazine in the 60s; for years his work has been appropriated in the name of Oz rock history. Now, finally, someone has bothered to find him, and so not only have the appropriate copyright clearances been obtained, Beard himself is profiled as a significant player on the scene, and his work is reproduced here as lovely new prints rather the rough copies of copies of halftones we’ve gotten used to seeing. Tomorrow is Today is a great remembrance and analysis of a vital era that’s rapidly slipping from our grasp. What’s next for Iain McIntyre? The very next stage, ‘the Sunbury Years’? Australian rock historiography could do a lot worse.